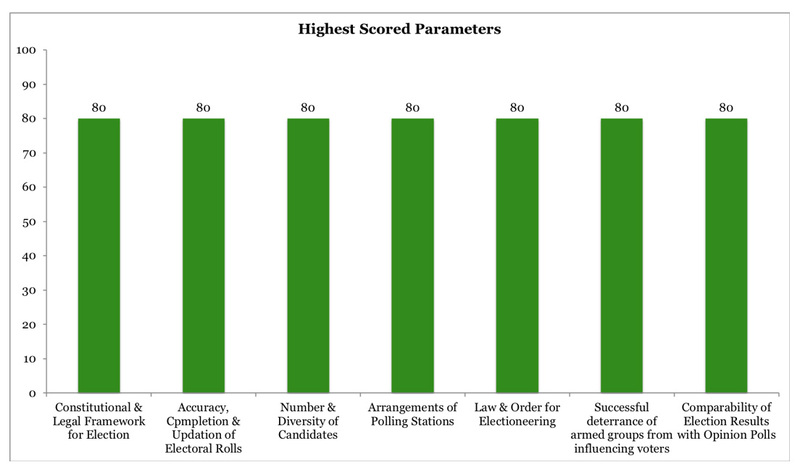 August 09; In the PILDAT assessment on Quality of General Election 2018, a marked improvement is noted in the Polling-day Operations compared to GE 2013 in terms of training and impartiality of polling staff and overall management of the polling arrangements for voters as the process received an overall score of 64% – highest scoring aspect of the quality of GE 2018 – compared to the score of 44% assigned to the same aspect in 2013. It must be noted that in terms of polling day management, a steady improvement is recorded since 2002 and 2008 when the process received a score of 40% respectively, improving to 44% in 2013 and now to 64% in 2018. This is the aspect of election which requires long preparation on the part of the ECP which, along with the polling staff and security forces, need to be commended for the marked improvement on this aspect of the polling day operations. Counting of Votes, Compilation & Transmission of Results have, however, received the lowest score of 40% thus depicting the counting, compilation and transmission of results as the weakest link in the management and quality of General Election 2018. The overall score of quality of General Election 2018 stands at 51.79% which has dropped nearly 5 percentage points from the quality of General Election 2013 assessed to be at 56.76%. PILDAT has proposed investigation into those aspects of the election about which a number of questions have been raised by various political parties and candidates. The next government and the opposition should agree on the mode and forum for such investigation which may be through an independent commission of enquiry whose terms of reference and composition should also be agreed. The PILDAT Score Card on Quality of General Election 2018 has also assessed Pre-Poll Phase which has received an overall score of 50%, Polling Day Operations and arrangements for voting which have received the highest score of 64% and the Post-Poll phase which has received the score of 50%. The quality of General Election 2018 has been assessed on 39 parameters under 4 broad categories of 1) Pre-Poll; 2) Polling; 3) Counting of votes, Compilation & Transmission of Results and 4) Post-Poll phase. Each parameter has been assigned equal weightage and graded on a scale of 1 to 5 with 1 indicating the poorest quality and 5 indicating the best quality. The PILDAT Assessment of Quality of General Election 2018 is a continuation of earlier similar assessments that have been carried out by the think tank after General Elections of 2002, 2008 and 2013. Similar assessments in the past assigned the overall score of 37.30% to the quality of General Election 2002 and 40% to the quality of GE 2008. The scores improved for quality of General Election 2013 at56.76% but have dropped again to 51.79% for the quality of General Election 2018. This drop in quality is mainly due to poor quality of Pre-poll phase which is largely attributable to the factors lying outside the direct remit of the ECP. Another factor adversely affecting the overall score of GE2018 is the issues reported in Counting of Votes, Compilation of Result both at the Polling Station and Returning Officer’s office and Transmission of Results from Polling Station and from Returning Officer’s Offices resulting in considerable delay in announcing provisional results and questions about the credibility of counting and compilation of results. While the quality of Pre-Poll Phase has received an overall score of 50%, it has declined nearly 12 percentage points in comparison to the quality of pre-poll phase of GE 2013 which had received a score of 62.35%. 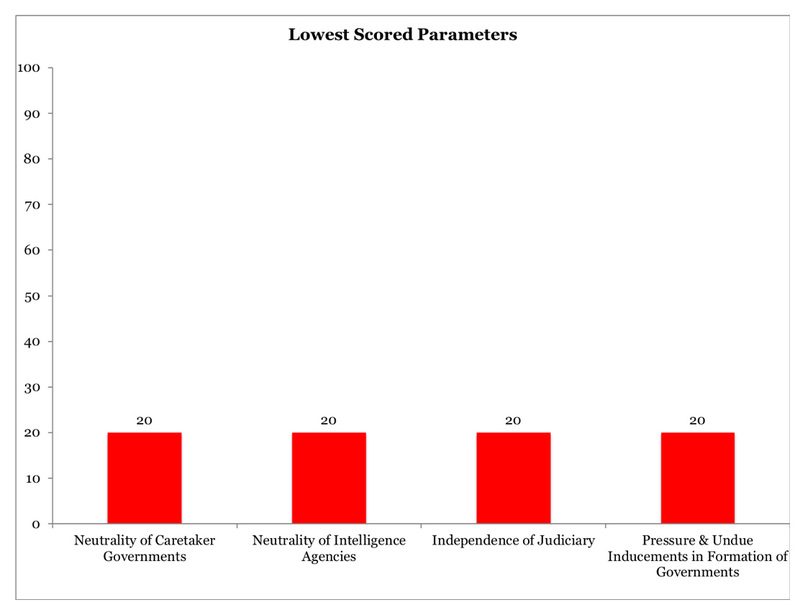 While PILDAT had already carried out analysis of perception of pre-poll fairness in May 2018 terming it Unfair, the score assigned in this assessment has been based on the period between April to July 2018 and in particular is low on the parameters of neutrality of the Federal and Provincial Caretaker Governments, impartiality of the intelligence agencies and independence of the Judiciary. 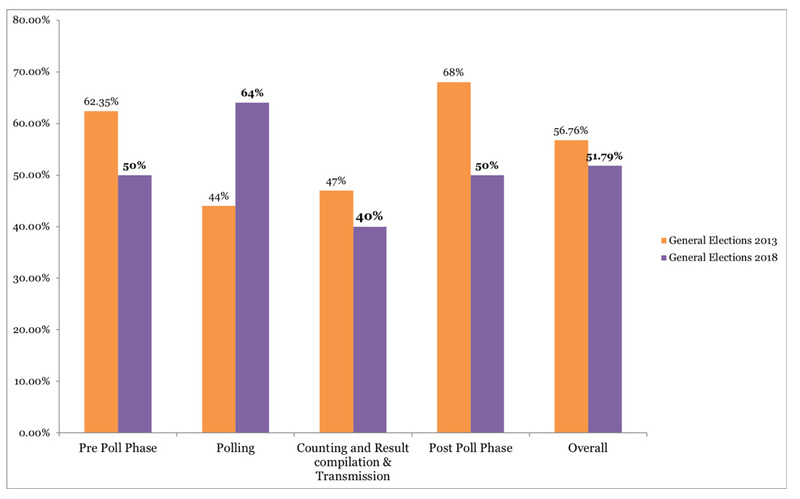 The PILDAT assessment shows improved Polling-day Operations in GE 2018 compared to GE 2013 in terms of training and impartiality of polling staff and overall management of the polling arrangements for citizens inside the polling stations as the process received an overall score of 64% – highest scoring aspect of the quality of GE 2018. The quality of management of polling day operations, satisfactory arrangements and environment of voting, however, seems to have taken a nose dive in the process of Counting, Result Compilation & Transmission of Results which have received the lowest score of 40%in the assessment. It must be noted that this is not just the lowest score for any single aspect of the quality of General Election 2018 but it is also the lowest score in comparison to the processes adopted in 2002, 2008 and 2013 when the similar process received scores of 43% respectively in 2002 and 2008 and improving to 47% in 2013 General Election which has, in 2018 General Election, plummeted to 40%. Each parameter under the Counting, Result Compilation & Transmission of Results including strict legal requirements of transparency of compilation of statement of vote count, availability of results to polling agents and display at polling stations, efficiency and accuracy of the transmission of election results from polling stations to returning officers, transparency of consolidation of results at RO level and efficiency and accuracy of transmission of results from ROs to the ECP has been called into question. PILDAT, therefore, proposes that an urgent, thorough and impartial investigation may be undertaken, a need which even the ECP has at least partially recognised by asking the Cabinet Division of the Government of Pakistan to arrange an investigation into the malfunction of the Result Transmission System (RTS) . While the leader of the victorious majority party PTI, Mr. Imran Khan showed magnanimity by offering to investigate rigging complaints of the opposition in any constituency, which is the legal responsibility of the ECP, he and his party can translate that promise by facilitating the setting up of an independent commission of enquiry whose terms of reference and composition should be agreed between the next government and the opposition. The proposed commission should investigate the issue and assign responsibility. The Post-Poll Phase has also seen declining score of 50% compared to the score assigned to the similar process after the GE 2013 which stood at 68%. Again, the assessment of the quality of this process shows that while the lowest score assigned to this process was 40% after General Election of 2002, which saw the worst-of-its-kind post-poll rigging in recent history, the score improved after GE 2008 to 56%, recorded significant further improvements with the score of 68% after General Election 2013 and has now recorded a decline even lower than GE 2008. This decline in the quality of Post-election score compared to GE 2013 may partly be attributed to the fact that PMLN had gained clear majority in the National Assembly and the Provincial Assembly of the Punjab in GE 2013 and it did not need to make intense efforts to win the support or joining of independent legislators to form the government. In GE 2018, since no party has a clear majority in the National Assembly and the Provincial Assembly of the Punjab, PTI and, to a lesser degree, PMLN are making intensive efforts to win support of independent legislators and forming alliances with other parties. Normally these efforts are considered legitimate part of the democratic process and promote inclusivity in formation of government but reported pressures and inducements offered to independent members by one party or the other may have contributed to the drop in the score for the quality of the post-election phase. The post-election activities are, of course, not directly within the scope of the ECP and, therefore, should not be a reflection on the performance of ECP. The PILDAT Score Card on Assessment of Quality of General Election 2018 is based on combined analysis and scoring of eminent persons who are members of PILDAT Dialogue Groups on Electoral Processes, Quality of Democracy and Civil-Military Relations and met recently in Lahore. These include (in alphabetical order by last name) Maj. Gen. (Retd) Athar Abbas, Former DG, ISPR and Former Ambassador, Air Vice Marshal (Retd.) Shahzad Chaudhry, Political and Security Analyst & Former Ambassador, Dr. Ijaz Shafi Gilani, Chairman, Gallup Pakistan; Lt. Gen. (Retd.) Moinuddin Haider, Former Governor Sindh; Former Federal Minister for Interior, Mr. Shahid Hamid, Senior Advocate, Supreme Court of Pakistan; Former Governor Punjab & Federal Minister for Defence, Dr. Parvez Hassan, Senior Advocate, Supreme Court of Pakistan, Mr. Javed Jabbar,Former Senator; Former Federal Minister for Information & Media Development, Mr. Wazir Jogezai, Former Deputy Speaker, National Assembly of Pakistan, Mr. Rustam Shah Mohmand, Former Chief Secretary, KP, Mr. Arif Nizami, Editor, Pakistan Today, Mr. Tasneem Noorani, Former Federal Secretary, Mr. Ghazi Salahuddin,Columnist; Former Editor The News, Mr. Mujib-ur-Rehman Shami, Editor-in-Chief, Daily Pakistan alongside PILDAT President and Joint Director, Mr. Ahmed Bilal Mehboob and Ms. Aasiya Riaz respectively.